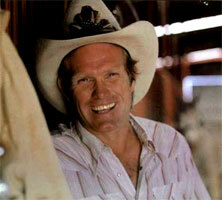 Chanteur Country US né Terry Paxton Bradshaw, le 2 Septembre 1948 à Shreveport (Louisiane). Terry Bradshaw (born Terry Paxton Bradshaw, September 2, 1948, Shreveport, LA) was the second of three sons born into a family whose loving parents provided strong parental guidance and religious upbringing. He had always felt driven by some strange force about which neither he nor anyone else around him had any awareness. It wasn't until Bradshaw was well into adulthood that he arranged to have himself tested to determine why he had always been so overly burdened by anxiety. The results uncovered a condition known as Attention Deficit Disorder (ADD). Realizing this, he was able to look back over his childhood and gain a better understanding as to why he had such a hard time sitting still without fidgeting. If he played baseball, he had to be the pitcher. If he played football, he had to be the quarterback. If he was in a band, he had to be the lead singer, which, during one brief segment of his life, he was. Bradshaw quarterbacked the Pittsburgh Steelers to victory in Super Bowls IX, X, XIII, and XIV and just after his first world title, he recorded the country album I'm So Lonesome I Could Cry, released in 1976 on Mercury. His live singing debut took place at the famed Palomino Club in North Hollywood, CA. Just before his performance, Bradshaw was standing in the wings motionless, expressionless, with eyes glazed over, awaiting his introduction and looking as though he was about to dash out of a tunnel onto a gridiron. The spectacle attracted all of the major local television crews who surrounded the small stage with a barrage of lights, cameras, and technicians, making it virtually impossible for the audience to see the show. Upon taking the stage, his backup band began playing the intro to his opening song, but the words wouldn't come for what seemed an eternity. The band repeated the intro over and over, then finally, to everyone's relief, he eventually gained enough composure to proceed and launched into the title song. 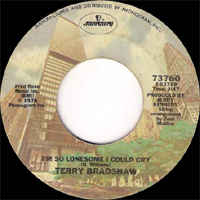 Bradshaw's cover of Hank Williams' "I'm So Lonesome I Could Cry" was beginning to pick up significant airplay by this time and shortly thereafter was certified a Top Ten hit by Billboard Magazine. But the mood during Bradshaw's performance seemed to indicate that the house was filled with those who came to see the football player, not the country & western singer. The show lasted 15-20 minutes, then Bradshaw was quickly ushered to his dressing room, which was adorned with fan paraphernalia and flower arrangements, the most conspicuous: a large, elaborate floral wreath from Burt Reynolds. Bradshaw came out with another single, "You Never Know How Good You Got It 'til You Ain't Got It No More," in collaboration with Glen Campbell, then later during the mid-'90s he would record a Christmas album, called Terry Bradshaw Sings Christmas Songs for the Whole World. This was not his proudest accomplishment. Clearly, Bradshaw does not define himself as a singer, but a football player who enjoyed singing in the choir since childhood, only to enter the recording profession on a bet hedged by his fame as a Super Bowl victor.